Nelson Mandela is a South African leader who spent years in prison for opposing apartheid, the policy by which the races were separated and whites were given power over blacks in South Africa. Upon his release from prison, Mandela became the first president of a black-majority-ruled South Africa in which apartheid was officially ended. A symbol of hope for many, Mandela is also a former winner of the Nobel Peace Prize. 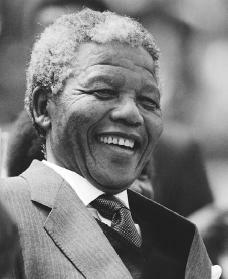 Nelson Rolihlahla Mandela was born in a small village in the southeastern region of South Africa called the Transkei. His father was chief of the village and a member of the royal family of the Thembu tribe, which spoke the Xhosa language. As a boy, Mandela grew up in the company of tribal elders and chiefs, which gave him a rich sense of African self-government and heritage, despite the cruel treatment of blacks in white-governed South Africa. Mandela was also deeply influenced by his early education in Methodist church schools. The instruction he received there set Mandela on a path leading away from some African tribal traditions, such as an arranged marriage set up by a tribal elder, which he refused. After being expelled from Fort Hare University College in 1940 for leading a student strike, Mandela obtained a degree from Witwatersrand University. In 1942 he received a degree in law from the University of South Africa. In 1944 Mandela joined the African National Congress (ANC), a South African political party. Since its founding, the ANC's main goal had been to work to improve conditions and rights for people of color in South Africa. However, its fairly conservative stance had led some members to call for less timid measures. Mandela became one of the ANC's younger and more radical leaders as a member of the ANC's Youth League. He became president of the league in 1951. The years between 1951 and 1960 were troubled times, both for South Africa and for the ANC. Younger antiapartheid activists (protesters), including Mandela, were coming to the view that nonviolent demonstrations against apartheid did not work, because they allowed the South African government to respond with violence against Africans. Although Mandela was ready to try every possible technique to destroy apartheid peacefully, he began to feel that nonviolent resistance would not change conditions in the end. In 1952 Mandela's leadership of ANC protest activities led to a nine-month jail sentence. Later, in 1956, he was arrested with other ANC leaders for promoting resistance to South Africa's "pass laws" that prevented blacks from moving freely in the country. Mandela was charged with treason (a crime committed against one's country), but the charges against him and others collapsed in 1961. By this time, however, the South African government had outlawed the ANC. This move followed events at Sharpeville in 1960, when police fired on a crowd of unarmed protesters. used to undermine the government) in its fight against apartheid. In 1962 Mandela was again arrested, this time for leaving South Africa illegally and for inciting strikes. He was sentenced to five years in jail. The following year he was tried with other leaders of Umkhonto weSizwe on a charge of high treason, following a government raid of the group's secret headquarters. Mandela was given a life sentence, which he began serving in the maximum security prison on South Africa's Robben Island. During the twenty-seven years that Mandela spent in prison, his example of quiet suffering was just one of many pressures on South Africa's apartheid government. Public discussion of Mandela was illegal, and he was allowed few visitors. But as the years dragged on, he was increasingly viewed as a martyr (one who suffers for a cause) in South Africa and around the world, making him a symbol of international protests against apartheid. In 1988 Mandela was hospitalized with an illness, and after his recovery he was returned to prison under somewhat less harsh conditions. By this time, the situation within South Africa was becoming desperate for the ruling white powers. Protest had spread, and international pressures for the end of apartheid were increasing. More and more, South Africa was isolated as a racist state. It was against this backdrop that F. W. de Klerk (1936–), the president of South Africa, finally responded to the calls from around the world to release Mandela. On February 11, 1990, Mandela walked out of prison. He received joyful welcomes wherever he went around the world. In 1991 he assumed the presidency of the ANC, which had been given legal status again by the government. Both Mandela and deKlerk realized that only a compromise between whites and blacks could prevent civil war in South Africa. As a result, in late 1991, a multiparty Convention for a Democratic South Africa met to establish a new, democratic government that gave people of all colors rights to determine the country's future. Mandela and deKlerk led the negotiations, and their efforts gained them the Nobel Peace Prize in 1993. In September 1992, the two leaders signed a document that created a freely elected constitutional assembly to draft a new constitution and to act as a transition government (a government that functions temporarily while a new government is being formed). On April 27, 1994, the first free elections open to all South African citizens were held. The ANC won over sixty-two percent of the popular vote, and Mandela was elected president. As president, Mandela worked to ease the dangerous political differences in his country and to build up the South African economy. To a remarkable degree he was successful in his aims. Mandela's skill at building compromise and his enormous personal authority helped him lead the transition to democracy. In an effort to help the country heal, he also backed the establishment of a Truth and Reconciliation Commission which offered amnesty (exemption from criminal prosecution) to those who had committed crimes during the apartheid era. This action helped to promote discussion about the country's history. Mandela retired in June 1999, choosing not to challenge Thabo Mbeki, his vice president, in elections. Mbeki won the election for the ANC and was inaugurated as president on June 16, 1999. Mandela quickly took on the role of statesman after leaving office, acting that year as a mediator in the peace process in Burundi, where a civil war had led to the killing of thousands. In late 2001, Mandela joined the outcry against terrorism when he expressed his support for the American bombing of Afghanistan after terrorist attacks against the United States on September 11, 2001. By January 2002, however, Mandela had modified his support somewhat after South African Muslims criticized him for appearing to be insensitive to the sufferings of the Afghan people. As quoted by the Associated Press, Mandela called his earlier remarks supporting the bombings an "overstatement" and urged caution against prematurely labeling Osama bin Laden, the man suspected of plotting the attacks, as a terrorist. Benson, Mary. Nelson Mandela: The Man and the Movement. New York: W. W. Norton & Company, 1986. Harwood, Ronald. Mandela. New York: New American Library, 1987. Hughes, Libby. Nelson Mandela: Voice of Freedom. New York: Dillon Press, 1992. Johns, Sheridan, and R. Hunt Davis Jr., eds. Mandela, Tambo, & the African National Congress: The Struggle Against Apartheid, 1948–1990: A Documentary Study. New York: Oxford University Press, 1991. Mandela, Nelson. Long Walk to Freedom: The Autobiography of Nelson Mandela. Boston: Little, Brown, 1994.
i think it's absolutely amazing how much mandela did to put an end to apartheid. it's truly a shame that so few people recognize his name, and even worse is that people don't seem to care enough to learn about the legend that is nelson mandela. A true saint,selfless and a true man of the people who needs to be aped by the egocentric non-patriotic African leaders of today who can practice 'arpatheid' to remain in power.Madiba is my hero that I adore and wish to emmulate in life after college.Where are such non-bloody revolutions to achieve and share in the great dreams of our African father?Since primary I have alys admired you and wish you long life so that I get to see you.You are a super achiever and my model. may allah nelson mendela live long life.He shows how to get their rights without bloodshed. Free Nelson Mandela was what I heard as a child. Now he is free..
May his soul rest in peace in Jesus name. God bless him. The legend,Nelson Mandela had leave an indeligble legacy worth of emulation,not only for S/Africans only.May his soul rest with God in peace. Today as the whole world gathered in South Africa to witness history in the making, and to bid a farewell to gallant son, father and leader of the African Continent Nelson Mandela Madiba. I was moved with the much cherished son of this great continent. Madiba your memories will never go off in our mind, your great work to humanity will never go in vain, your untold suffering will bring blessing to this land the Africa as whole. we wish you well in the next world and may your spirit cause the remaining leaders in this continent to rise to the challenge of poor health service delivery, racism, corruption and above conflicts. May hie soul rest in peace in the bossom of our maker. We loved you Mandela. Nelson Mandela is the man who has changed the course of history . Probably in last 1000 years , none other than him has influenced so much as Mr Nelson Mandela . May God have all his mercies on the departed soul and make this world a better place to live without hatred, killing and exploitation . Human race learn to live as one , with out the difference of color , religion and language . I pray and wish that World of today replaces its bombs , bullets and barriers with peace , compassion and consideration. Humans should be a source of healing to all rather damage and destruction . OKAY, SO I WOULD LOVE TO ADD MY POINT OF VIEW TO THESE COMMENTS. I REALLY LIKE TO YELL WHILE HAVING PHILOSOPHICAL CONVERSATIONS WITH RANDOM PEOPLE. NELSON MANDELA IS A HERO. HE IS SO AMAZING, AND THE HOLY FATHER SHALL BLESS HIM (I don't believe in God, though)! THANKS A LOT.